Whew! Good. I don’t really want to know which kid prompted that lecture from the teacher, but having been in many classrooms of stinky kids, I can understand why she brought it up. It’s sad when kids come to school with dirty clothes or not combed hair and you wish you could make things better for them at home. Then they talked about kids at school who were ignoring the rules and getting tickets; who is getting the most tickets, etc. They are a good group of kids. “We’re here for a birthday party,” said, smiling. “Oh, our birthday guy is not here right now, but come on in and I’ll call him.” he said. “Great,” I said, not smiling quite as much. He called Jason, the guy who was supposed to do our party, but he didn’t answer. We were indeed on the schedule, though, so I hadn’t screwed up. 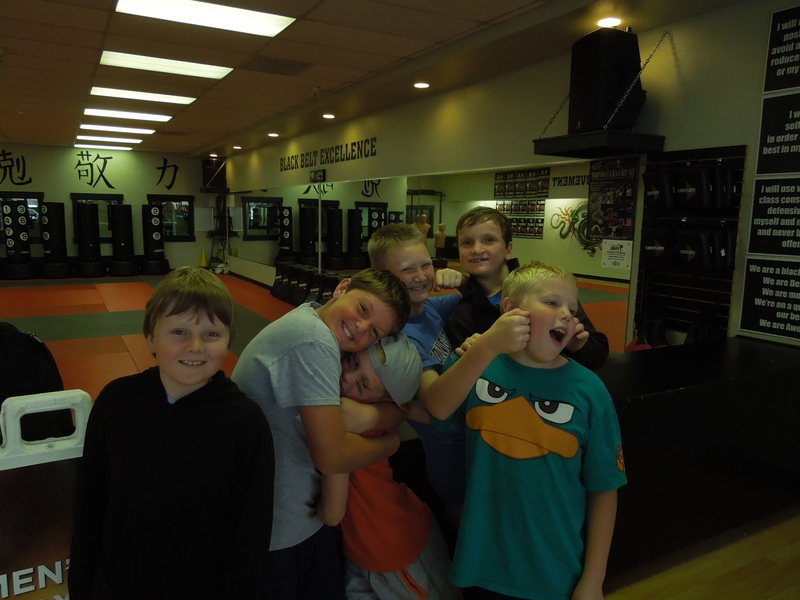 The kids were excited, and didn’t seem to mind that there was a possibility that I would be scrambling with no party plans. The guy (who was just leaving) said he was so sorry that Jason wasn’t there, and if we would give him a minute to change, he could do about an hour party/class with us. That sounded great to me. 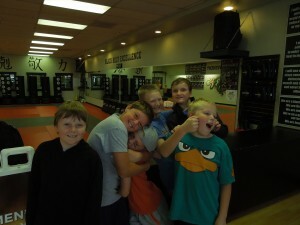 The boys all took off their huge shoes and socks and proceeded to roughhouse on the wood floor. When the teacher (whose name was Dallas) came out, they scrambled to sitting, as if they had been sitting there waiting the whole time. Right. He explained about respect being the number one rule in martial arts, and taught them a few punches, and did a few drills with them. Then he brought out the bags and let them do some kicking. The boys were in heaven. John even got to break a board with a kick. 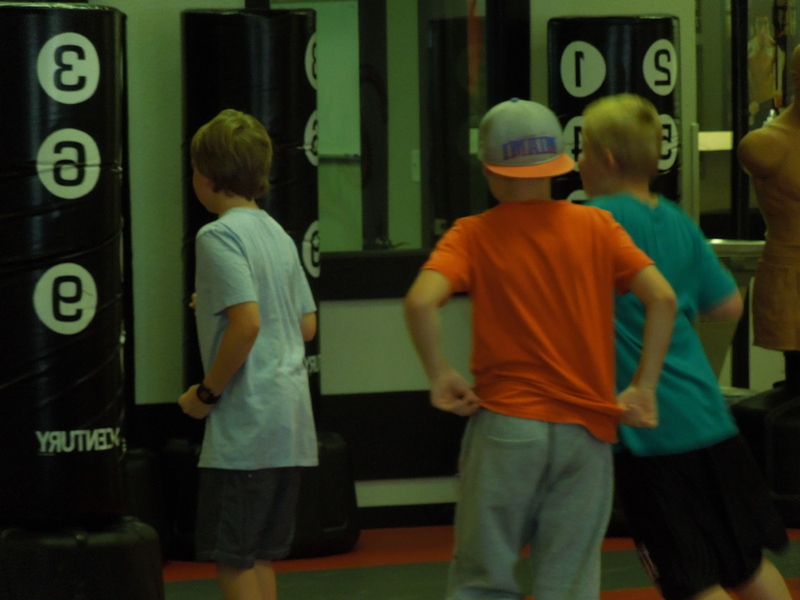 It took him a couple of tries, and the instructor talked to them about how that is just like life. If we can’t do something the first time we try, we don’t need to feel like a failure, we just try it again, and again, until we can do it. 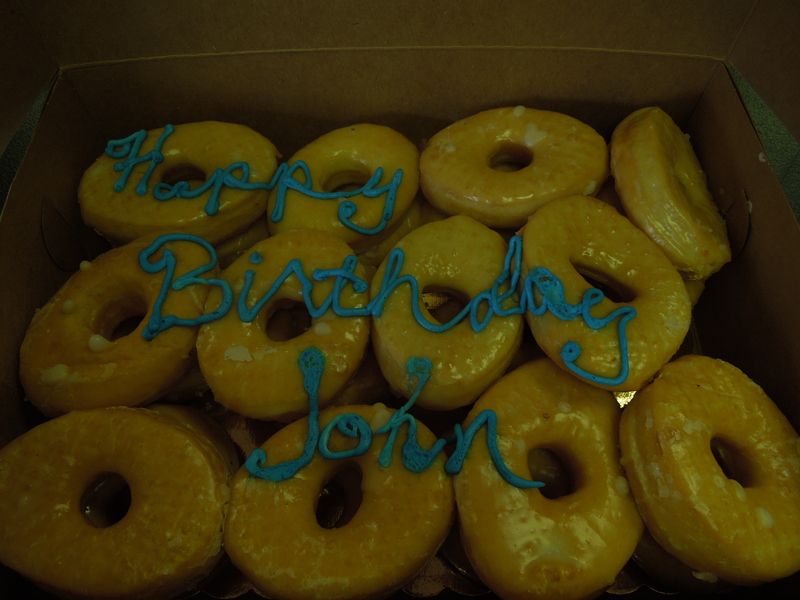 Instead of a cake, I had a “donut cake” which was just two dozen donuts with Happy Birthday John written on them in icing. Easier than a cake and they could eat it with their hands. The boys loved that idea. John even got to use a samurai sword to cut a donut in half. I am SO grateful that Dallis was willing to stay and do a party for us. Even if it was a shorter party, it was great for these boys. And great for me! What would I have done with them? 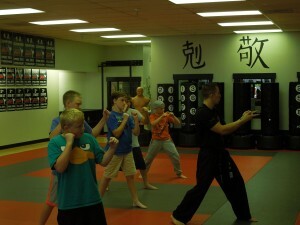 I promised them a karate party! He apologized over and over that his employee wasn’t there and that it wasn’t the real party, but I think it was really fun anyway. 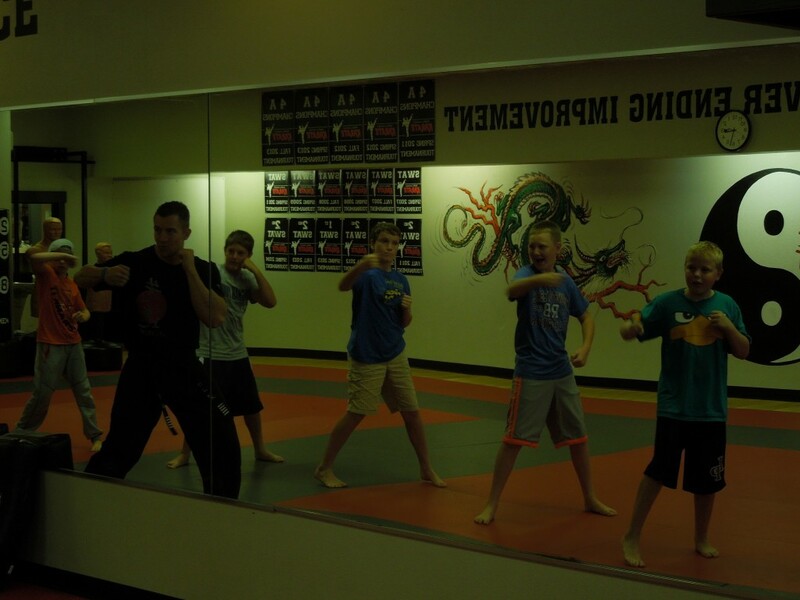 And he gave each of the boys a vip pas so they can come to the studio for a month of Karate lessons for free. They thought that was GREAT! I’m so thankful he was willing to stay and do that for us, not just say there was a mix-up and leave us to do our own party (we would have ended up home watching Karate kid for sure). 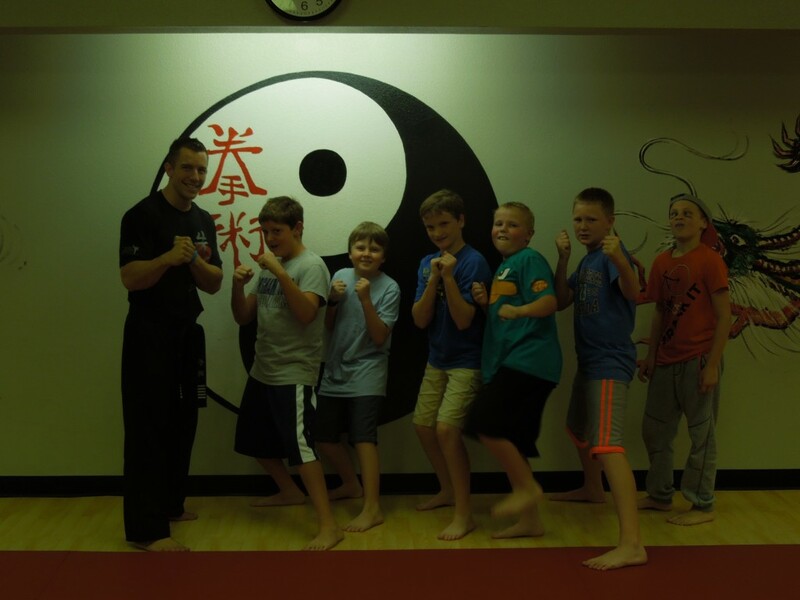 When we got back home, the boys all ran off to play nerf gun wars and didn’t even mind that the karate portion of the party was less than it should have been. They were just happy to be together at ANY kind of party. Now this Friday I get to play host to Natalie’s 16 birthday, a murder mystery party. Hooray! 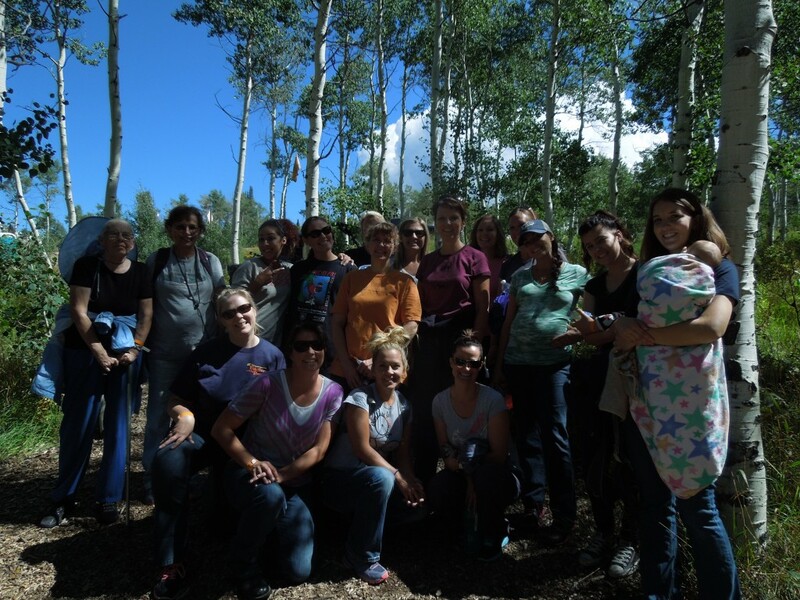 Last weekend our Relief Society group went up to the Heber Valley Girl’s camp for a ladies’ retreat. We met at 5:00 in the church parking lot, and after a full day of Kindergarten subbing (my first sub job of the year), I was ready for some adult interaction with my friends. The drive up was fun, talking to friends. When we got up there, it was time for dinner, and they had it all ready for us. 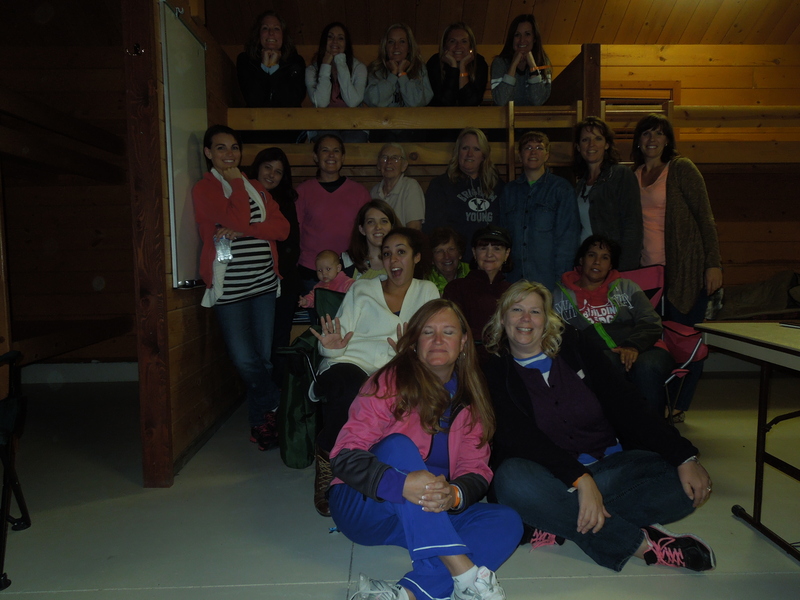 We unloaded our stuff into the cabins and enjoyed a yummy dinner of chili, salads, and cornbread. Once we were stuffed with yummy food, we got our jackets (because it was starting to get cold) and sat down for a class taught by a new couple in the ward who do motivational speaking. One of the activities they had us do was to get into groups and we were supposed to look into one sister’s eyes and think “Who are you?”. Then write down 5 or 6 words that we think describe her. 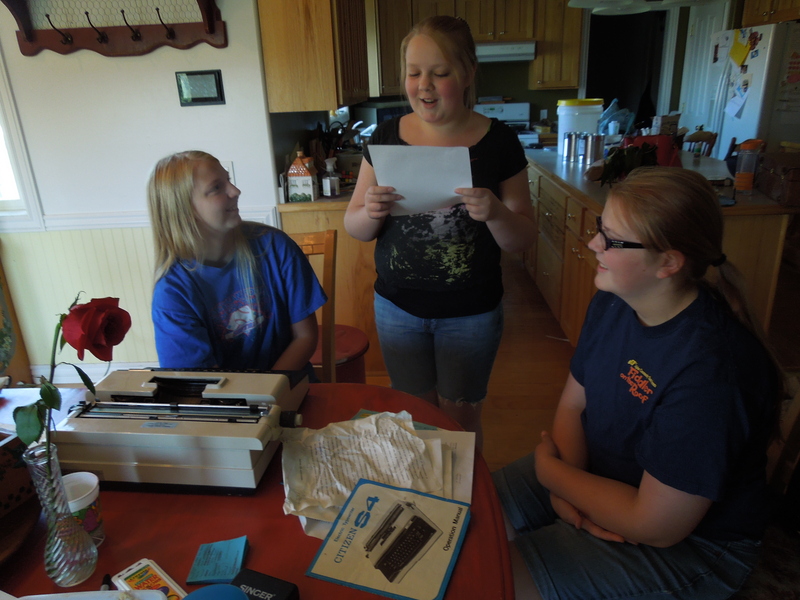 Then the 3 of us would come up with the top 5 words we thought were perfect for them. 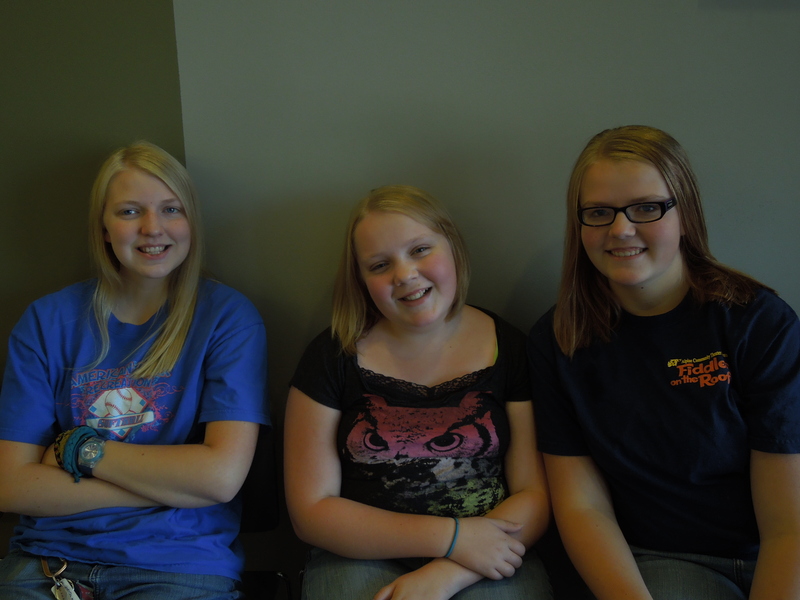 As we were discussing each sister, it was interesting how we would think of their best or most interesting qualities. I ended up writing down things like “Creative, problem solver, and industrious” for one sister. Another sweet sister who seems to do everything perfectly, I said “calm”. She always seems calm to me. As she read her list, she said, “Thank you for saying you thought I was calm. Do you really think I’m calm?” I really do. When it got to be my turn I realized how uncomfortable this was, to just sit and have people look into your eyes and write things about you. My list was words like “Energetic, motivate, friendly, fun, talented, service.” Some of the words I understood, but the Motivator and Energetic? I tried not to cry. I don’t feel like I’m motivating to anyone, and it seems I can barely get through my day, let alone my to-do list. It was nice to see myself how other people might see me. And if they can see the good qualities in me, it should be easier to see myself as my Heavenly Father sees me. We had fun staying up to talk and eat snacks, although I was still so full from dinner I didn’t really eat many of the snacks. My friend, Serena joked with me that it was past my bedtime (because it totally was), but I stayed up until about 12:30, when we all mosied into our cabins to go to sleep. I don’t have much of a pad to go under my sleeping bag, and those bunks in the cabins are just bunks, so it was quite hard. Luckily, even though it was cold and windy outside, it was a nice temperature inside, so I slept on top of the sleeping back with the blanket I had brought. Darn if I didn’t forget my earplugs, though. But I slept some. Enough to have a few strange dreams. Breakfast in the morning was french toast with rasberries and buttermilk syrup and bacon. So great! We were very spoiled. The theme of the retreat was “One drop at a time” from Elder Ballard’s book by the same title, and we read from that book about how each bee only makes 1/12 of a teaspoon of honey from all his work. Our good works may only be a drop, but at least they are good works, and we can add to them one drop at a time. When we had signed up for this camp, we could sign up for a hike and/or a ropes course. I haven’t been in Relief Society for a few weeks, so I didn’t remember which I had signed up for. But we all decided to go on a short hike, and then we all went to the ropes course together. We knew there was a zip line but we didn’t know much else. WE got there and there was indeed a zipline, but in order to get to it, you had to first climb a 26 food pole, then tightrope walk across a cable up 26 feet, holding on to ropes to get across. I looked up and didn’t know if I could do it. I mean, I am overweight and severely out of shape and not keen on climbing. But then I saw Sister Hansen. She’s about 70 years old and she was the second in line to suit up in the harness. If SHE can do it, I could certainly give it a try. I had to try. Up the pole I went. Climbing, pulling myself up, listening to the missionaries who were telling me where to place my feet and where to reach my hands. Even though I was breathing hard (practically panting), I made it to the top of the pole. Once I was there, I didn’t really know how to get onto the tightrope, but the missionaries were there to coach me along. I got to the tightrope and I did not look down. I just kept scooting sideways (always be sure to keep your foot farther out than your shoulder, they said), grabbing each rope until I got to the end. There were no more ropes, only a sister missionary there to reach out her hand. I had to scoot a couple more feet before she could help me onto the platform. I made it. I can’t believe I made it. I was feeling joy, fear, amazement, pride, and terror all at the same time. So weird. She unhooked me from one rope and hooked me onto the zipline rope. “you’re going to have to let go of this pole,” she said, “The pole does not go with you.” I chuckled and let go and scooted a little closer to the edge. She told me I was good to go. I had to finally just step off. Once I was did it, it was fun and exhilerating. But I had to take that step. I had to step with faith. Wow! So incredible. 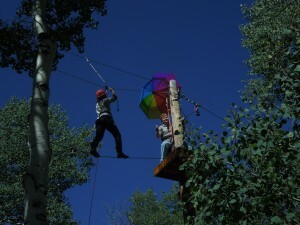 I wished I could try it again (not the climbing and tightroping part, just the zipline part). And my fellow sisters were there cheering me on. It was awesome. 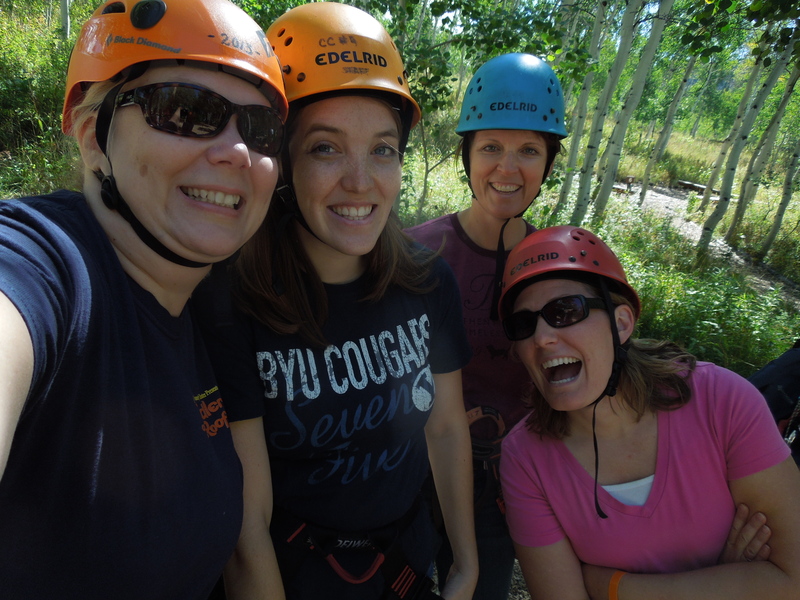 There were 15 or 16 of us who did that ropes course. For so many of them it was easy and fun. For me, it was terrifying and life changing. But I DID it. I did it! That’s Buckbeak, my sweet little rooster. Buckbeak thinks he needs to get up on the patio table and crow and crow and crow. He crows when he feels like it all day. 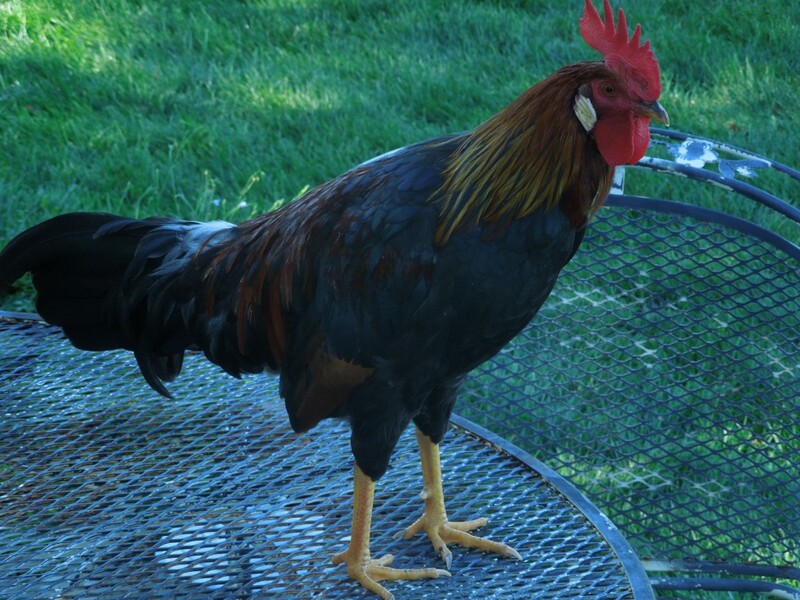 I thought roosters were just supposed to crow in the early morning. But I’d rather he crow during the day than in the early morning, I guess. 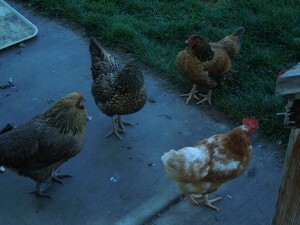 His girls are all scattered around. They like the patio, too. Not sure why. Is it warmer than grass, or do they just like to be close to the house? 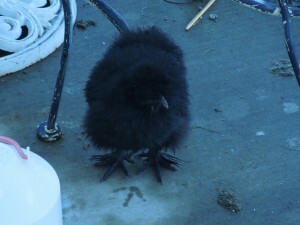 Whatever the reason, they end up pooping all over the patio, which is gross and a huge pain to wash off. This little one is Sasha. She’s the same age as Buckbeak, but is still just a tiny little thing. Maybe she’s not going to be very big. She’s a sikly. Can she even see through that mess of feathers on her face? And then there’s Fox, our sweet little three legged cat. 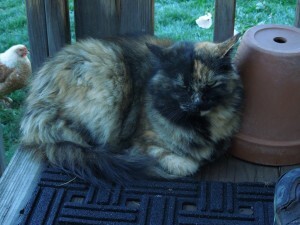 She likes to curl up on the back porch, too, even though I bought her a nice soft cat bed that sits on the FRONT porch. 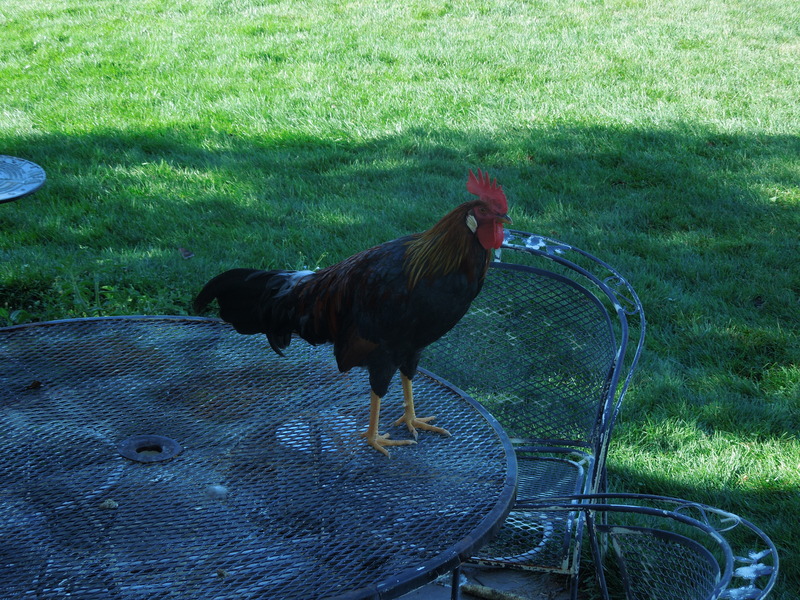 If I moved it to the back porch, I fear chickens would just walk on it and poop on it. I don’t know why she prefers to sleep on wood, but there she is, trying to nap. Ignoring (or attempting to ignore) those feathered creatures that must surely be a bother to her, but she never chases them. That’s me. 25 feet up in the air, walking across that tiny cable. I did it. Not ready to say goodbye to summer just yet. Wonderful weekend! I’ve read through the past few posts and they have been kind of downer posts. Got to do something about that, don’t I. Well, we had a GREAT Labor Day weekend. I’ll skip over the details of the week, but lets just say I had a few more chime kids the second day, I got very familiar with the steam canner (I canned over 60 quarts of peaches, pears, and tomato juice) and we got ourselves a new little birdie. On Friday, Megan came home and it was wonderful to hug my girl again. It’s been hard for me to have her gone, and missing her makes me miss Cole even more. Weird. So even though it’s only been two weeks since she left, I was SO happy to have her come home for the weekend. Friday we also welcomed our friends Robin and Ron, so we had a full house again. Hooray! Friday night we went out to dinner at the Spaghetti factory. Yum. Saturday morning Robin and I got up and hit the garage sales shortly after 7:00. We found some GREAT stuff, I tell you. I may go into more detail on that later. Even though there were more sales, we had to stop about 9:30 because I was a-out of money, b-needing to use the bathroom, and c-was supposed to meet someone at 10:00. 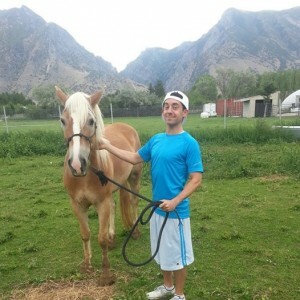 Ipona is the name of the horse in the video game, The Legend of Zelda. Yeah, I wouldn’t know that, but my kids do. Anyway, we spent the next hour mostly watching, sometimes helping these three guys film shots for their video. It’s not been released yet, so I can’t post a bunch of pictures just yet. I don’t even HAVE too many pictures, as I left my camera and phone in the car (duh). 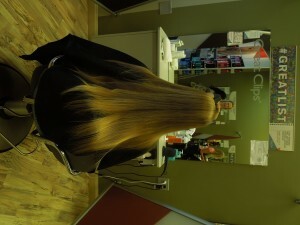 It was fun to watch the process, and when we left Keith thanked me profusely for my help (what help? I didn’t do much, but I’m glad it worked out. Later that day we examined out yard sale loot and were pleased with our haul. Even Ryan, the skeptic of all skeptics, said I had done well and gotten some good deals. A BOSCH bowl for $2?! Crazy, right? A Whisper mill wheat grinder for $3? Insane. That evening we went to my parents’ house for dinner. Mom had said we would eat from the garden…Corn, Tomatoes, Beans and Peaches. Yum. We also had sloppy joes and potato salad that we had made. It was all so yummy, and we all laughed a lot and had such a nice time. Sunday was another great day as we got to go to Ryan’s niece Marissa’s homecoming and gathering at the house afterward. More great food. We were so stuffed. Monday morning we tried to find more garage sales. It was pretty bleak, but we did at least find one, and it was a good one. 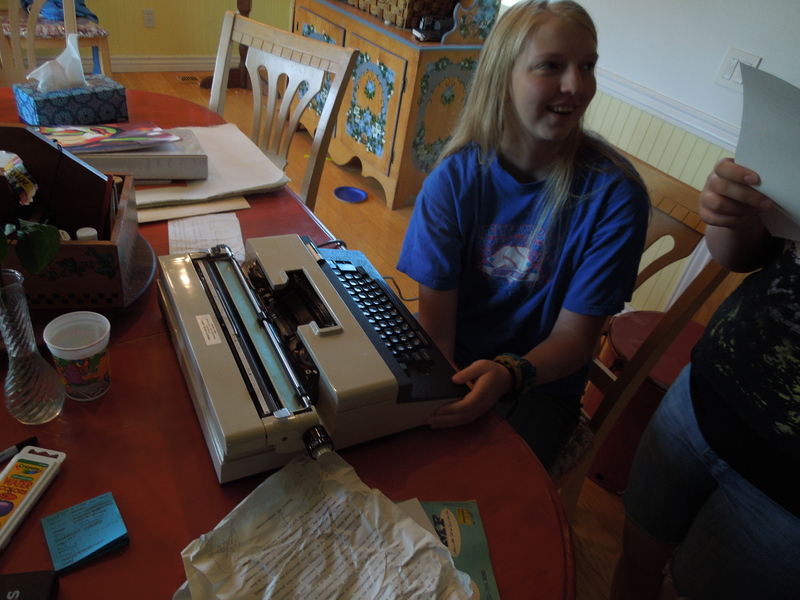 Megan had mentioned that she wanted a typewriter, so I bought her one for $2. 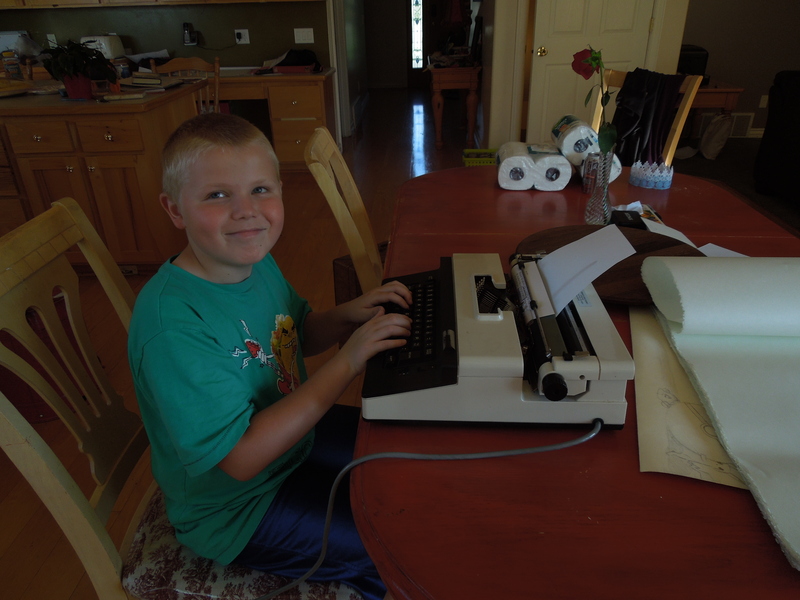 Everyone had fun typing and playing with it, once Ryan adjusted it for them. Then I took all three girls over to Great Clips for hair cuts. 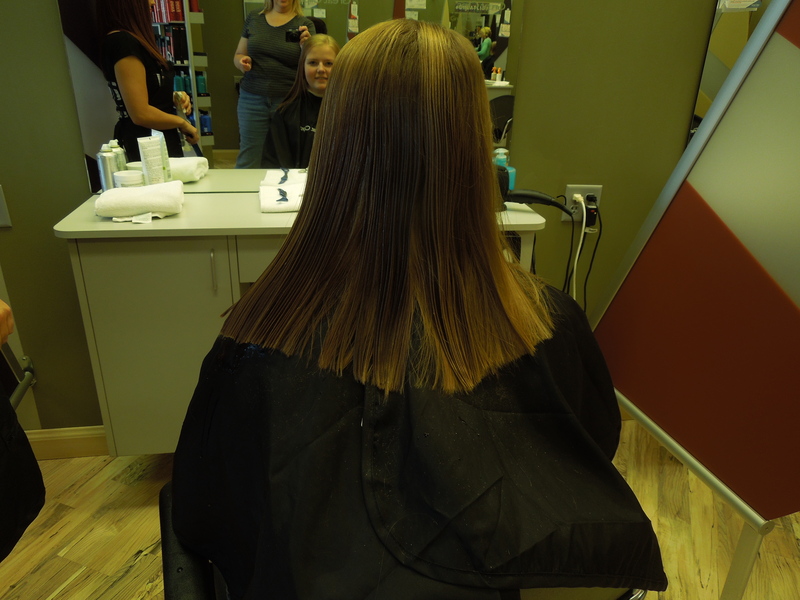 Megan wanted a trim, but Natalie and Jenna went for it. Then I took Megan to Walmart to stock up. I think she’ll have enough food now. Plus, I gave her peaches, pears I just bottled, ham from the freezer, butter….anything I could think she might need. Her car was packed and it was mostly food. She took a cooler in the car with her to keep everything cool for the 90 minute drive. What a GREAT weekend. And tomorrow…..is John’s birthday.